The Pittsburgh History & Landmarks Foundation has had a long track record of applying the principles of historic preservation to create a vital and distinctive Downtown in Pittsburgh and in the commercial corridors and districts in and around the Downtown area. 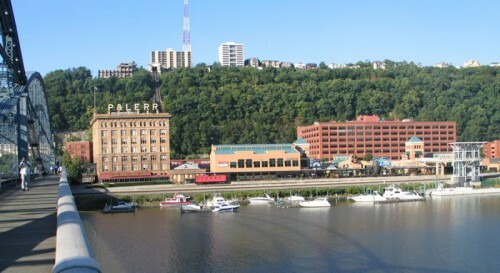 In the mid 1970s, PHLF began its most ambitious and successful program, the redevelopment of Station Square, a riverfront development along the Monongahela directly opposite Downtown. PHLF conceived the idea in 1975 when there was talk of tearing down some of the under-utilized Pittsburgh & Lake Erie Railroad buildings, which were constructed between 1897 and 1917. Although few Pittsburgh leaders and politicians believed that PHLF would be successful, the Allegheny Foundation, a Scaife Family charitable trust generously provided PHLF with an initial $5 million equity grant and supported the development for two decades. And, for the first time in Pittsburgh, underdeveloped riverfront land was utilized as an amenity for people. Five historic railroad buildings were adapted for new uses, and a hotel, a dock for the Gateway Clipper fleet, and parking areas were added. PHLF developed Station Square without using city, county, or state funds, and repaid a federal loan ahead of schedule. The total investment by PHLF and its sub-developers was over $100 million. Upon completion of Station Square, PHLF had taken a site that generated $47,000 in real estate and nothing in parking taxes to one that produced $4 million a year in real estate and parking taxes, created 3,000 jobs, with 143 businesses. When PHLF sold Station Square in 1994 because its historic preservation goals had been achieved, the sale proceeds of about $25 million plus continuing economic participation were added to funds that help continue the organization’s work in neighborhood revitalization, historic preservation programs, and educational activities. PHLF is only one of few such organizations in the preservation field that has been able to generate revenue while putting its mission to practice. Now owned by Forest City Enterprises, Inc., a Cleveland-based real estate developer, Station Square continues to be a popular Pittsburgh destination, which offers commercial office space, entertainment, parking convenient to Downtown Pittsburgh, riverboat entertainment, and other amenities. Activist, innovative, practical, fiscally prudent and resourceful, persistent, flexible, and egalitarian: these qualities characterize PHLF’s commitment to preservation of the past. In Downtown Pittsburgh, PHLF continues displaying those characteristics and principles through preservation easements that protect buildings, restoration that creates commercial retail spaces and housing in historic buildings, and is helping to renew the economic vitality of the central business district. In 2015, PHLF, together with private developers, the City of Pittsburgh’s Urban Redevelopment Authority, the Commonwealth of Pennsylvania, other nonprofit organizations and small business owners are all contributing to the burst of renovation activity that is creating a stimulating and economically vital downtown with national architectural distinction. Buildings like the Verizon Building at Seventh Avenue and William Penn Place are being carefully repointed and looking spectacular. Mellon Square has been restored and the historic buildings around it—the Union Trust and former Alcoa, James H. Reed, and Henry W. Oliver buildings—are all being renovated. PNC Bank has opened a service center in the former Mellon Bank building, whose interior was destroyed by the short-lived Lord & Taylor department store. But none of the preservation-oriented development going on in Downtown Pittsburgh happened overnight. Indeed, at a critical point, PHLF played a pivotal role in opposing former Pittsburgh Mayor Tom Murphy’s 1999 plan, which would have decimated 64 buildings in the Fifth Avenue-Forbes Avenue area, flattening the definitive architectural and historic value of this city area to be replaced by a mall with a music store as an anchor tenant. Instead, PHLF with others worked to successfully advocate––and implement––a revitalization strategy combining restoration and adaptive use with new construction. 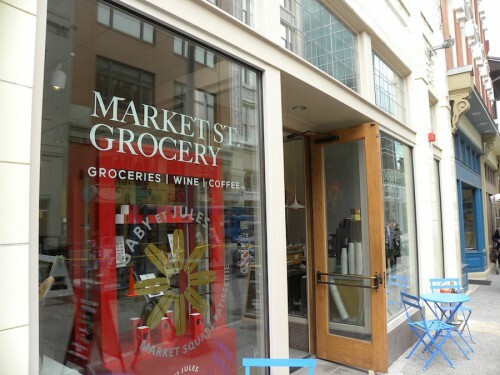 An outstanding example of this strategy is the LEED-Gold-certified Market-at-Fifth developed through a limited partnership affiliated with PHLF. Three historic buildings––two from the 1870s and one from 1908––have been rescued from demolition, restored, and adapted to house seven apartments and two retail tenants: Heinz Healey’s Gentlemen’s Apparel and Nettleton Shoe Shop. The project qualified for the federal 20% rehabilitation tax credit. Restoration work on a fourth building, the former John R. Thompson’s Building at 435 Market Street (a 1907 commercial building) was completed in early 2015, and a local real estate developer and the proprietors of Vallozi’s Pittsburgh, opened a thriving upscale urban market in April 2015, the first of its kind back in Downtown Pittsburgh. In 2011, the City of Pittsburgh unveiled a major preservation program, which sought to restore the facades of 10 buildings through a $4 million grant from the Commonwealth of Pennsylvania’s Redevelopment Assistance Capital Program. The restoration initiative was managed by PHLF under contract with the Urban Redevelopment Authority of Pittsburgh, overseeing architecture, engineering, exterior lighting, life safety improvements, and bidding and construction management. In 2013, PHLF restored three cast-iron facades at 418-22 Wood Street, and Landmarks Development Corporation, a for-profit real estate development subsidiary of PHLF acquired 420 and 422, which are being renovated for retail, office, and possibly housing options on the upper floors. In November 2014, Katie’s Kandy, a sweets and confectionery store, opened on the first floor at 422 Wood Street and the upper floors are being developed for office space. 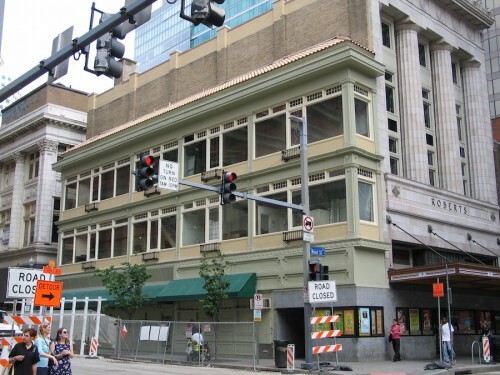 In May 2015, PHLF completed restoration of the facade restoration of the Skinny and John M. Roberts & Son Co., buildings at the corner of Forbes Avenue and Wood Street in Downtown Pittsburgh, marking 11 restored facades on 10 important buildings in the central business district. PHLF continues work in Downtown Pittsburgh’s Wood Street corridor on two buildings stretching from 413-17 Wood Street. Boutique la Passerelle, a women’s clothing boutique remains a tenant of PHLF at 417 Wood Street and 413-15 Wood Street is currently vacant and slated for full restoration with an aim towards creating more retail and office space.